APPLE BARREL PLANTER LADDER home decor, jewelry, decor, decorations, electronics, fountains, floor mats, art glass, vases, garden essentials, fireplace screens. Your online store for sensational deals on Home Decor Merchandise, Electronic and Personal Items. Roll out the barrels and add a dollop of country charm! 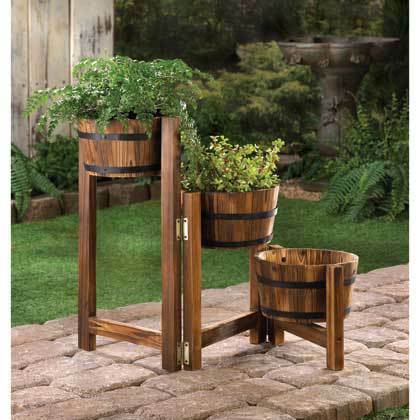 The simulated fir wood barrels of this planter trio have authentic metal banding and are fastened to sturdy wooden posts. Its hinged tri-level design gives you the freedom to adjust it to fit anywhere in your yard. Open: 36" x 9 3/4" x 22 5/8" high; Closed: 12 1/2" x 9 3/4" x 22 5/8" high; each bucket is 9 1/2" diameter x 5" high. Material(s): WOOD - FIR. Weight 6.9 pounds. Why Shop With Spice Your Decor? Welcome to Spice Your Decor powered by ECWID. Add a new dimension to your home or office. Your one-stop place for items to decorate your personal spaces inside and outside to make it uniquely your own.